In accordance with Field Marshal Haig’s instruction to prepare for a large German offensive in the Spring of 1918, the 22nd Battalion spent most of the 1917/18 winter in Flanders helping to build and train in the art of defence, something unfamiliar to the New Armies of Britain and the Empire that had been on the offensive for the past two years. Located in the area around Ploegsteert the 22nd Battalion was primarily engaged in work on the second or Corps Defence Line. For the men of the 22nd Battalion and 6th Brigade this meant utilising the strong natural features afforded at Hill 63 and the natural obstacle of Ploegsteert Wood. Here under the supervision of Major Dooley the men worked on building the wire entanglements in the frosty conditions and frozen ground (see photograph below showing men from the 22nd Battalion working on the wire entanglements on 26th December 1917). By the 24th March 1918 word had reached the battalion that a tremendous German offensive had been launched on the Somme and all training schools and leave were cancelled, though at this time enemy activity opposite them in the Warneton Sector had become quiet. However on the Somme all the old Pozieres and Bullecourt battlefields that had been won at such a heavy cost were within a matter of days in German hands. A move south was expected and on the 31st March the 10th Cheshire’s that had been fighting on the Somme arrived to effect the relief. On the 2nd April 1918 motor buses were boarded at Neuve Eglise and the battalion moved to Berthen, about nine kilometres from Bailleul. The men rested and spent the time cleaning equipment in preparation for the move, and from the big hill outside Berthen a last view was obtained of Ypres and the Flanders battlefields. Two days later the 22nd Battalion reached the village of Godwaersvelde, where a train was waiting to convey the battalion to the Somme once more. 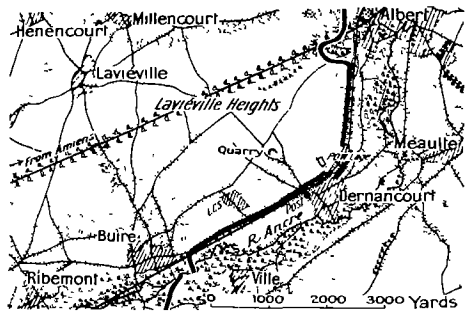 As the German Army using their numerical advantage in artillery and their newly developed and effective Stormtrooper tactics advanced westwards at a pace not seen since the formation of the trench systems, the threat to the British and French Armies being split at their junction on the Somme, and hence to the important transportation hub at Amiens, was becoming extremely serious. Haig looked to reinforce his beleaguered British Fifth Army and the AIF 3rd & 4th Divisions were the first to be sent south, both divisions playing a major part in stopping the German advance in its tracks around the villages of Hebuterne, Dernancourt and Villers-Bretonneux (see German Spring Offensive – AIF Divisions). 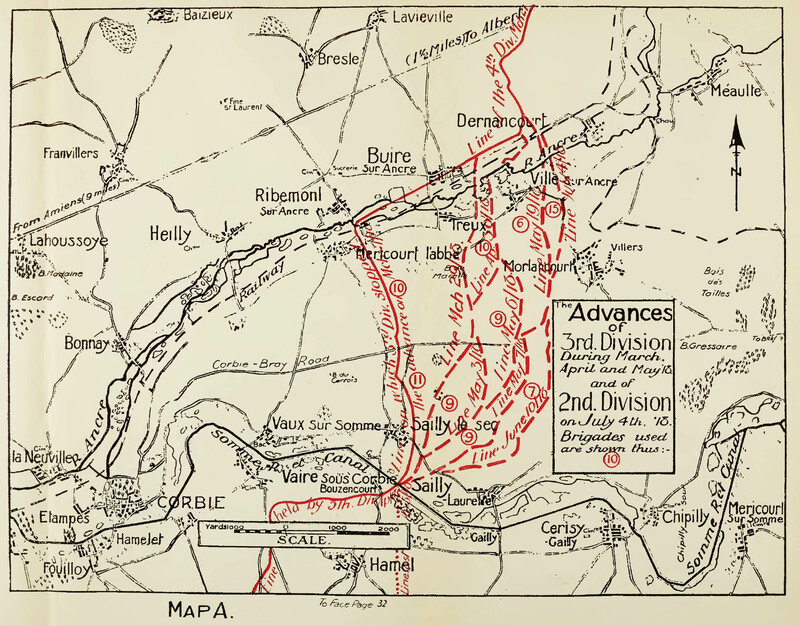 By the time the AIF 2nd Division and the 22nd Battalion had detrained in Amiens on the 5th April, unbeknown to them at the time General Ludendorff had that day suspended the Somme ‘Operation Michael’ offensive, choosing instead to focus north from where the Australians had just left, and to an attack towards the Hazebrouck railhead, gateway to the channel ports. Again the pace of advance of ‘Operation Georgette’ was rapid and word was received with incredulity that the line had been breached despite the intricate barbed–wire defences that had been installed there by the Australian Corps throughout the winter. 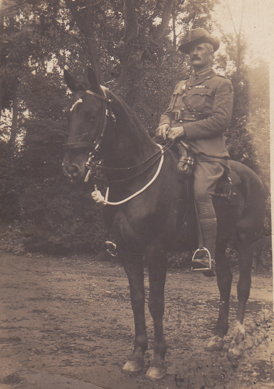 Major Dooley (photograph above, courtesy of Lieut. Harricks collection), who for many days and nights had supervised at much personal risk the construction took it personally and led the call for vengeance against the Hun! By the time the 22nd Battalion returned to the Somme, Albert and the villages to the east of Pozieres and Bullecourt now lay in German hands and its forces were now placing artillery fire and danger on the pivotal city of Amiens. Amiens was now deserted except for a few scattered groups of civilians passing and making for the railway station, its streets now littered with debris and tangled wire. For the men of the Twenty-Second their morale was high, exalted by the emergency and by his knowledge of the seriousness of the situation. Early on the 6th April the Battalion, now in fighting kit, was taken by bus to La Houssoye on the main Albert-Amiens road and after a march through Franvillers halted at St. Lawrence Farm and where orders were received that it would that night relieve the combined 46th & 47th Battalions in the front line near Dernancourt (map above) effecting the relief by 10.30pm. The strength of the battalion was 41 Officers and 784 other ranks as they moved back to the front line, while the nucleus personnel moved to Allonville. In these exposed positions the men were vulnerable to enemy sniping. In one such case 699 L-Sgt Thurlow, a crack rifle shot himself, who despite being subjected to heavy sniping accounted for many of the enemy and thus obtain complete superiority of the situation. For his conspicuous courage and daring in performance of work as a sniper at Lavieville L-Sgt Thurlow was awarded the Military Medal. Another notable sniper was Pte Wilson, helping to make the 22nd Battalion the most deadly within 6th Brigade who totalled 57 certain hits during the April tour of the front line. However a skilful German sniper opposite the Battalion’s right caused many casualties, devoting his talent against the battalions Sergeants, six of whom were made casualty, before he himself was dealt with. A feature of this sector was the constant strafing of Pioneer Trench and the Albert-Amiens Road. The bombardments occurred in short violent bursts and it would soon sever all signal wires running to the forward positions. This disruptive activity put strain on the Signallers and it was in re-establishing communications during an intense bombardment that Lieut. McCartin (photograph left) was wounded, his conspicuous gallantry and devotion to duty recognised by the award of a Military Cross. On the 10th April the Battalion was relieved by the 21st Battalion and returned to the Support Line surrounding Lavieville. Thus began a period of rotation with its sister battalion from the 6th Brigade until the end of the month. The expected attack never came, but tension was high and the strain severe. During this time much digging improving trenches, and erecting wire entanglements under hostile shelling was done. As a result of the German advance, there were no facilities for bathing or changing underclothing. Nearby deserted houses, many of which were being systematically destroyed, were raided and tubs for bathing salvaged and clean underclothing taken, regardless of gender! The 22nd Battalion returned to the front line on the 14th April, relieving the 21st Battalion, with the 24th Battalion on the left and 26th Battalion (7th Brigade) on the right. The front line tours were marked by a number of patrol encounters, one of which Lieut. Barker – of the Gallipoli contingent and a prominent footballer – was killed. For his gallantry during the encounter in dispersing the enemy and bringing back the body of his officer 3969 Sgt Waxman received the Military Medal. Lieut. Armstrong was wounded on another patrol and 2nd Lieut. Sutherland was wounded a few days later. Following another rotation the 22nd Battalion was finally was relieved by the 21st London Regiment on the 1st May and moved to Warloy and into Brigade Reserve with 35 officers and 683 other ranks with the battalion. Arriving at Querrieu the following day the 6th Brigade was held here in readiness to counter-attack should the Germans break through on the Villers-Bretonneux front. By now the German focus had turned away from both the Somme (Operation Michael) and the Lys (Georgette) and was now further south on the combined French and British divisions on the Aisne (Operations Blucher-Yorck) and Matz (Operation Gneisenau). The German Spring Offensive, although having great successes in the early stages of each of the four operations ultimately failed due to exhaustion, logistics re-supply and the lack of replacement for its crack troops lost in the offensive. The amount of ground taken was impressive by First World War standards, but in most cases these were in poor, war-ravaged areas with little strategic significance, often in salients therefore difficult to defend when the renewed Allied offensive came. The morale of the German Army, high in the beginning, quickly sank with the realisation that the last opportunity to win a decisive victory before the Americans tipped the balance once and for all in the favour of the Allies had gone. For the Australian Imperial Force their steadfast defence on the Somme and on the Lys (AIF 1st Division) while large parts of the British Army was crumbling enhanced their reputation as one of the most reliable and capable fighting units of the war, a view held amongst their Allies, foe, and local population alike. For the men of the 22nd Battalion, and the AIF 2nd Division in general, their part in the Spring Offensive and hence fatalities was minimal when compared with the other four infantry divisions. The men of the Twenty-Second would soon play their part as they remained in the Morlancourt Spur area (see map above) between the rivers Ancre and Somme for the rest of the spring and early summer as the Australians developed and executed their dark art of ‘peaceful penetration’ on the opposing infantry, placing the enemy under great strain and wearing them down before the eventual and decisive hammer blow fell.